The Arctic wolf inches towards you. Like you, he is torn between fear and curiosity. His instinct leads him towards the scent of your leather boots. Your instinct is to reach out to this curious white canine. Suddenly, he snarls, and you’re face to face with a wild animal. For years, photographer Jim Brandenburg has observed lone wolves by moonlight, Arctic wolves leaping onto ice floes, and wolves hunting and foraging for food. Packs of gray wolves surround his house in Minnesota. 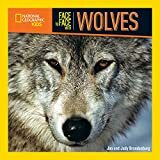 Let him lead you on an intimate journey through their mysterious world, making a persuasive case for the protection of this threatened species, and showing how wolves and humans can live together. I like this book because it tells you a lot about wolves and gives you some facts and tells you about what they have to go through.